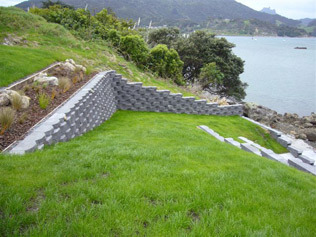 A retaining wall to prevent a coastal frontage slipping into the sea. 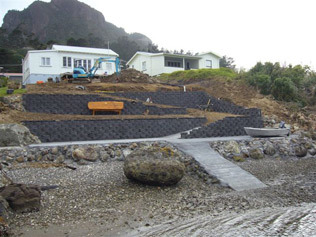 It was decided that a keystone retaining wall would provide a robust solution to the coastal erosion. This was a difficult work area for large machinery with law of gravity issues and salt from the sea! A section of the keystone wall. This photo also gives a good idea of the steep angle of the slope that we were working with. The family bach now has a firm lookout with a welcoming view from the sea and an easy ascent back home after a day on the water. “From our first conceptual meeting Shaun and his team had an excellent comprehension of what was required at our family Bach. 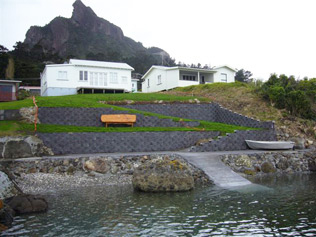 In short the seaside of our property was slipping in to the sea and needed retaining quickly and in a fashion that would stand the test of a life time and the power of the sea. Throughout the design stage of our project Manaia Excavators had invaluable suggestions in terms of the design from the vast experience in the district and with projects like ours. Our project was logistically challenged at every turn, between working during winter and a narrow and not to mention step coastal site. We had a lot of material to get in and out. 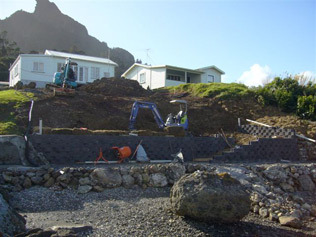 The team at Manaia excavators used an array of machinery that made the whole operation seamless. The skills this team displayed with the machinery were formidable. During the Construction of our project the team’s consultation and expertise was invaluable. Over the course of the project there were array of problems or challenges, as Shaun described them nothing that couldn’t be solved. Our project was an amazing thing to do and Shaun and his team have completed an unbelievable job creating a well retained coastal property with new beach access and something our family can enjoy for generations.